PRX Editors present a selection of pieces made by teens who have experienced incarceration first hand. Reginald Dwayne Betts went from the high school honor roll to the penitentiary. He spent nine years in prison beginning at age 16 for a carjacking in Virginia. Now, he'll be the first person in his family to graduate from college — and he's giving the main student address at the University of Maryland commencement ceremony. Reginald Dwayne Betts went from the high school honor roll to the penitentiary. He spent 9 years in adult prison beginning at age 16, for car jacking in Virginia. Tonight he'll be the first person in his family to graduate from college, and more than that, he'll deliver the student commencement address at the University of Maryland. Betts beat the odds in a big way. Recidivism rates are already high within the juvenile justice system, and they're 34% higher for youth tried as adults. The Senate is currently considering the Juvenile Justice and Delinquency Prevention Act (JJDPA), a bill that would make it harder to place youth in adult jails. Reginald Dwayne Betts looks back on everything he’s endured to get where he is today. Five inmates, four correctional officers and a judge were given tape recorders. At the age of 15, Cristel viciously attacked a rival classmate with a razor blade. The crime was one of the most violent acts ever committed by a young girl in Rhode Island. Now, after 3 1/2 years of incarceration, Cristel is getting ready to be released early. Many in the state consider her to be a poster child for rehabilitation. Weed, cocaine, morphine, oxycontin, crack, Ryan has tried them all. Once he developed a tolerance for one, he just moved on to the next. Now he's incarcerated, serving time for six drug charges, and slowly discovering the benefits of sobriety. But staying clean is still a daily challenge. Ryan has tried just about every drug you can think of, and maybe even some you can't. Now incarcerated at Long Creek Youth Development Center in South Portland, Maine, trying to face up to a drug-free life. This dreamy feature puts listeners in the mind of Mark, a young man who feels hopeless against the cycles of drugs and violence in his life. Time is running out for Mark. After being in and out of the Long Creek Youth Development Center six times for various drug-related offenses, he is about to turn nineteen and age out of the system. Mark feels stuck in his life, unable to make significant changes. This piece juxtaposes Mark's dream-like reflections with emotional reflections by Mark's mother as the two of them anticipate his impending release date. This feature puts listeners in the mind of Mark, a young man who feels hopeless against the cycles of drugs and violence in his life. This piece originally aired on the Blunt episode, "Law & Order", at WMPG in Portland, ME. When Nikki became a mother of two at the age of seventeen she promised to leave her life of drugs and crime behind. It was a promise she couldn't keep. Nikki, who's serving an 18th month sentence at the Long Creek Youth Development Center in South Portland, Maine talks about what it's like to be separated from her young children. "IF THESE WALLS COULD TALK: Inside Youth Speak Out" is a poetry series drawn from testimonial writings by the youngest members of America's prison system. While in Juvenile Hall, detained and incarcerated youth are invited to participate in weekly writing and conversation workshops which encourage them to dig deep, and seek meaningful insights through thought-provoking topics. These young men, women, girls and boys reveal childhoods and teen years so often defeated by aspects of the lives they have lived so far. They address things, people, or events that are critical to acknowledge during rehabilitation before returning to their homes, schools, and communities. Living out loud through rap, rhyme, and essay, these youth see the web as a portal --a way to let loose their stories in hopes others might put an ear to the wall and hear who they really are. Here, 20 writers read their own works, sometimes lending a voice to one another's. 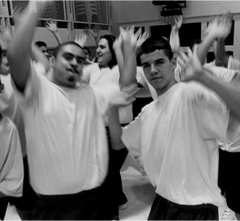 Produced by Susan Stone with the boys and girls of San Francisco's Juvenile Justice Center, and the support of Malcolm Marshall, Youth Speaks, and the inspiration of David Inocencio and The Beat Within. Gloria reads through her 21-year-old brother's letters from prison -- and finally replies. "Don't think I'm just saying any of this for you to bond me out. I'm serious about everything that I"m saying. I'm sorry for real. By the way, happy birthday." After Gloria's brother was jailed for attempted murder, he began to write her letters. She saved them, but never responded, until now. We hear excerpts from these letters from prison, and we hear the responses that Gloria's brother may never hear. Hearing Gloria's anger, defiance, and tears sheds light on the love and fury that remain long after the verdict is reached. An examination of the direct relationship between schools and prisons. 15-year-old Keith Tingman remembers his tenth birthday better than any other birthday before or since. That was the day he watched his mom get arrested. 15-year-old Keith Tingman remembers his tenth birthday better than any other birthday before or since. That was the day he watched his mom get arrested after being falsely accused of stealing someone's wallet. Ultimately, both of Keith's parents were convicted of possession of stolen property. His dad served ten months in Riker's Island, and his mom was put on probation. Keith is far from alone. A recent University of Michigan study shows that among African-American children born in 1990, more than one-quarter have had a parent serve time by the time they turn 14 years old. Joey, an incarcerated teen, calls home. Listen to Joey, an inmate at the Long Creek Youth Development Center in South Portland, ME, call home to talk to his mother and sister.